All captions via Ann Pfau. 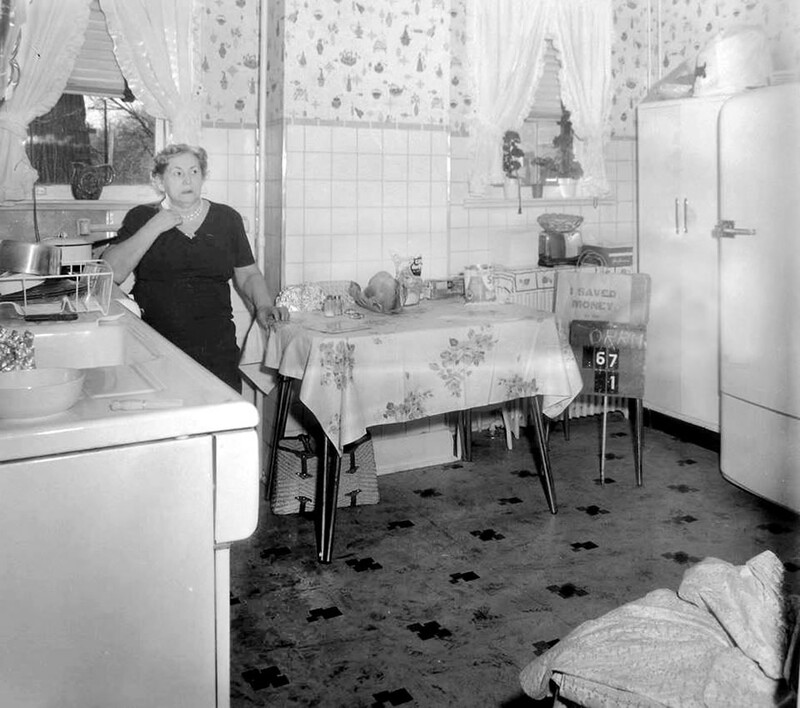 Minnie Weinstein in her kitchen at 67 Orr Place (aka 76 Myrtle), April 1963. According to the 1940 Census, she'd lived there with her husband, Max, since at least 1935, and both Max and Minnie were born in Russia ca 1890. Inside Frank and Assunta Palombi's Hotel and Restaurant, December 1962. 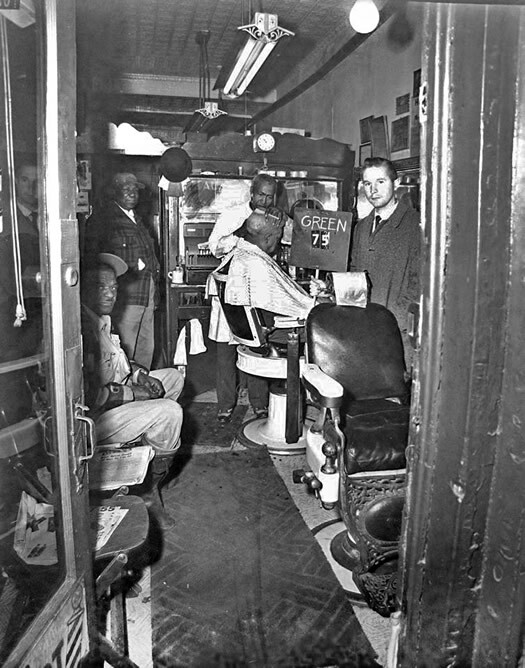 Left: Lucius Major's barbershop at 75 1/2 Green St, December 1962. 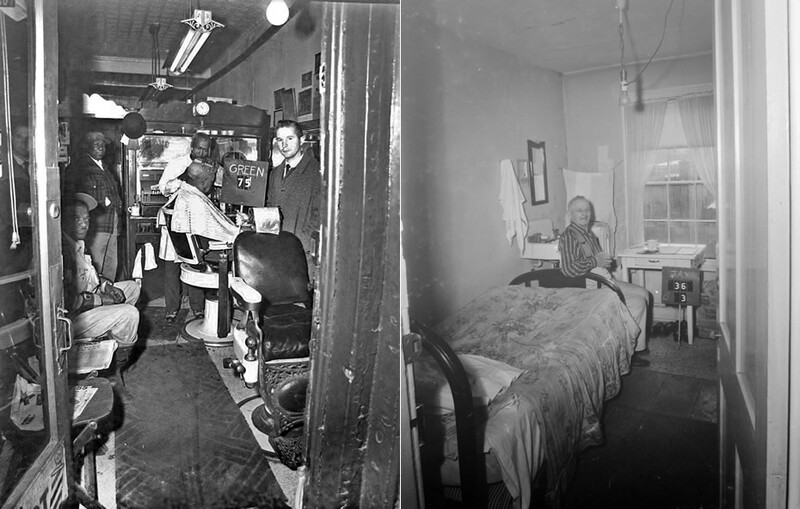 Reba Johnson also ran a beauty parlor in the same building, likely using the same chairs. (My guess is that Major taught her the trade.) Lucius and Reba (who may have been common-law spouses) lived at 57 1/2 Green; the 1960 city directory lists Johnson as the owner. According to the 1940 census, Major was born in South Carolina and Johnson in Georgia; they both moved to Albany in 1935 or before. There are a handful of photos above that have been collected as part of the project -- click or scroll all the way up. How'd this project come about? David Hochfelder: We moved here seven years ago from New Jersey and we'd always been interested in the history of the Empire State Plaza as this piece of monumental architecture. And about a year and a half ago we started getting more interested in it because of local filmmaker Mary Paley and her film The Neighborhood that Disappeared. So we did some research and identified the photographs at the Albany Institute that document almost all of the structures that were demolished. And Ann did a lot of digging around in the State Archives and found photographs taken by the Department of Public Works. And the DPW photos in the State Archives really document the interior of about 300 structures -- maybe more -- that were demolished and these have been the photos we've been posting on Facebook and Twitter. They show the interior of a lot of the houses that were demolished, they show people in their businesses, they really give a human dimension to this 8,000-person neighborhood that was demolished from 1962-1964. Ann Pfau: We really started tweeting by mistake. We took advantage of a Facebook group called Albany The Way it Was, run by Julie O'Connor and Al Quaglieri, and because the DPW photos we found were so good, we posted some on Facebook and got such a response from people. Some people who had family connections to the particular house or remembered a grocery store in the neighborhood, and they really started talking about living in this area and their feelings about the Empire State Plaza. And we thought, wow, this is such great material. The Albany Muskrat posted one of our photos from the Facebook page, so we thought we ought to have a Twitter presence, which is how we became 98 Acres in Albany. As you've been going through all these materials, what are some of the things that have stuck out for you, or that you've noted? AP: Because these are negatives, sometimes you don't realize how good a picture is until you take it back to Photoshop and invert it. So, for example, we posted Lucius Major's barbershop, but we didn't realize that we had so many figures in there looking out at the photographer while the barber was in the middle of doing his work. So it's kind of hard to know on the light board what you're going to find. DH: What really surprised me, the photographs at the Albany Institute, for example, are exterior shots. And some guy took a camera and went down the block, over and over again, for about six weeks in 1962. So about every property, virtually, is documented in the Albany Institute's collection. What really surprised me about the DPW photos in the State Archives is the human dimension to this story. It's not just the properties that were demolished, but the state photographers almost seemed to want to do a Dorothea Lange or Lewis Hine kind of documentation of the neighborhood. So we're really getting a window into the lives of some of the people. 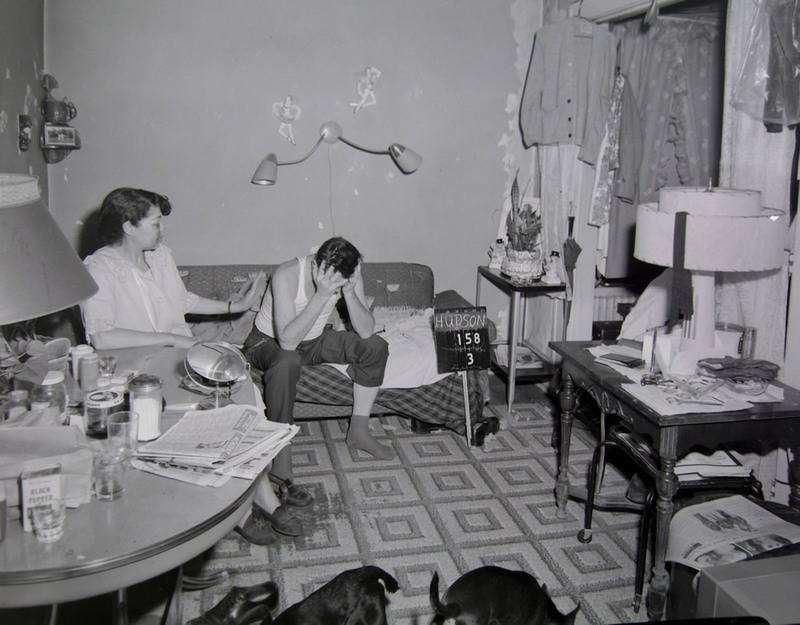 ... We found a wonderful photograph that looks like it was taken in a furnished apartment or rooming house, showing a man with his head in his hands, one shoe on one shoe off, two small dogs at his feet, and a woman who looks possibly African-American or mixed race consoling him. And we thought this would be a really good photograph that could tell a story. AP: That was the first one that we posted on Facebook because that was the first one that really struck us. DH: We haven't processed these, but recently I found photographs in the DPW collection that look like one of the last houses demolished, 157 Elm Street, showing an elderly woman with her things packed, steamer trunks and so forth. And the house is in beautiful condition, and you look at the exterior photos taken at the same time, toward the end of 1964, it's clear this is one of the last structures to be demolished. So there's a story there that we really want to tell about this woman and why she held out for so long and kept the house in such good shape. What was it specifically about the ESP that drew your attention to this topic? DH: We're professional historians, so part of it is just curiosity and this is what we do -- this is an interesting episode in Albany's history, how can we investigate it and document it. And once we started seeing these photographs, it really broke the project open for us and allowed us to bring the human dimension in in a way we didn't expect. AP: But I think we've always had this curiosity about it since our first visit to Albany, driving in on the arterial. It was kind of a shocking experience for me. DH: If you're driving in on the arterial from 787, and it's your first time in Albany, you see the D&H building, which is this lovely kind of almost Cathedral of Notre Dame-looking building, very gothic looking, and you see the row houses and the 19th century streetscape. And you see this thing -- and this is how I describe it to people, and it might reveal that I'm also a geek as well -- it reminds me of the Star Trek original series episode where they land on the planet that's fighting a computer war with the other planet. It just looks like the future circa 1965, a future that in many ways didn't come to pass. And it's stuck on top of this beautiful 19th century city in a way that struck me as very jarring or doesn't seem to fit the natural contours of the city. AP: We also thought of Stacy [Sewell, project partner], who grew up in this area. And I don't want to tell her story, but she does tell us when she was in high school taking the bus to Albany from Schenectady or Niskayuna that seeing the Empire State Plaza and knowing the art collection was in the plaza was this sort of exciting escape. DH: So, it means different things to different people. AP: And that's something we'd like to capture. I think it's important to let the people who were displaced tell their story. But I also think there are other people who have different attitudes toward the Empire State Plaza and I'm hoping this will be a forum for a lot of different people to tell a lot of different stories. There's a lot interest in local history around here -- we see this all the time on AOA. How many cities have multiple Twitter feeds and Facebook pages and Pinterest boards dedicated to local history. Why do you think that interest is so strong here? DH: Part of it is that Albany has an extraordinarily rich history for a city of its size. Albany has been a transportation crossroads since its founding. It's also been a high tech hub going back to the canal and railroad era, and still is. I think it really punches above its weight because it is the capital of what until 1960 or 1970 was the most populous and wealthiest state in the nation. So Albany really has a historical presence larger than its size, a rich, long and significant history. So I think that's one reason. As far as why individuals might be interested in that history... I think this goes back to like the Morris Gerber collection at the Albany Institute, people have been curious to document the city's history for long time in a way I haven't seen in other places. AP: And in some ways, because you have the State Archives, the State Library, the State Museum, on top of local institutions, you probably have more opportunities to do local and state history than in other parts of the state. Pfau and Hochfelder say they're currently processing photos from the State Archives and Albany Institute, as well as working on lining up grants to fund development of the website for the project. They're also looking for partners -- people and institutions who'd like to share materials or memories. Their hope is to have the website online by 2016. And a longer term goal is for their project to serve as model for other similar historical projects documenting demolished neighborhoods in other cities around the country. As I've said in the Facebook group, that top photograph gets my vote for best photograph of all time. Carl--absolutely. It's a striking photo. The state photographers really captured the human side of this story. This is incredible! Thank you to 98 Acres for doing this, and thanks to AOA for documenting it. There is something so clinical and creepy about the sign with chalked-in street names and house/apartment numbers. It's something between a director's slate and the rulers and labels that you see in pathology photos. This is really incedible. Thank you for sharing this important and forgotten piece of Albany's history. Paul, this is a great video! Is this a state film? Can you tell us anything about who made it, for what purpose, etc.? Email me at dhochfelder@albany.edu. I'm relatively new to Albany---only 19 years---but have met so many Albanians who lived, worked or shopped in the South End before ESP. So much more than real estate was lost. Thank you for helping to tell the story. This is a great project ! "And in some ways, because you have the State Archives, the State Library, the State Museum, on top of local institutions, you probably have more opportunities to do local and state history than in other parts of the state." Pic of Hunters Pharmacy brings back memories! 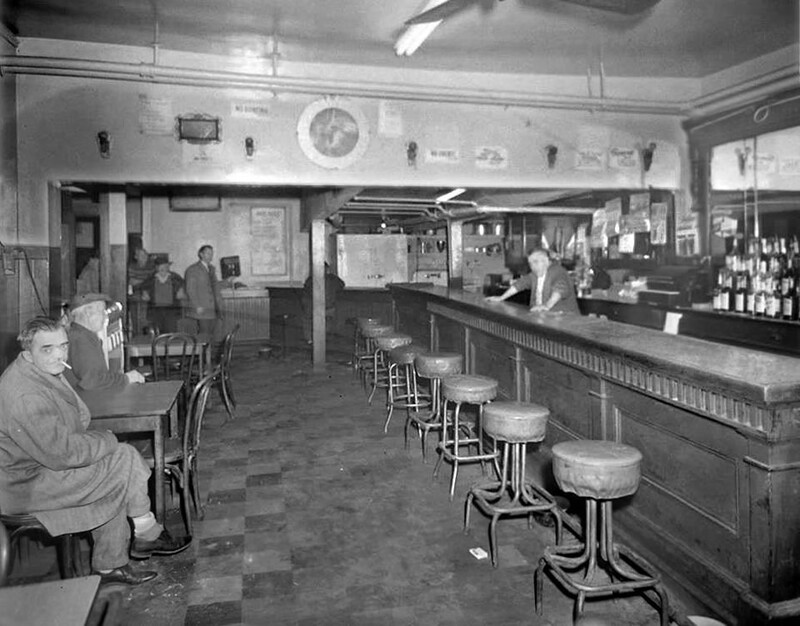 I use to get milk shakes there, remember sitting on those stools in the pic. I lived at 24 Jefferson street. We'd love to learn more about your recollection of the neighborhood. If you read this, please get hold of me at dhochfelder@albany.edu. 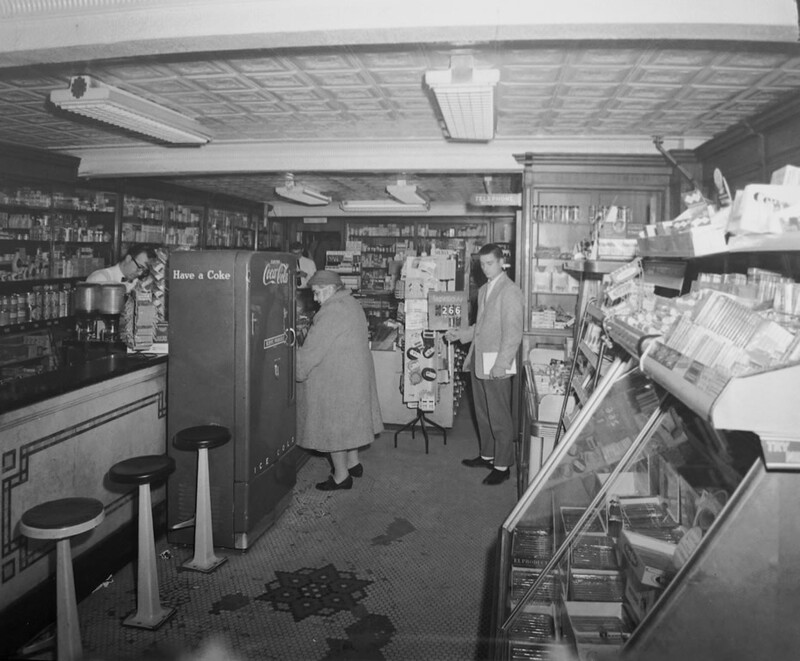 I too remember sipping shakes on the stools at Hunter's Pharmacy. The woman in the photo looks like my Cathedral Academy grade school teacher, Mrs. Merchant, who lived on Madison Avenue. Her house is still there - mine was taken by Governor Rockefeller at 158 Elm Street. Great memories! I would love to reminis about the Mansion section of Albany. As an infant, I lived on lower Jefferson St. Across from the side door of the Cathedral. We later lived at 70 Jefferson St. in my Grandfather's house, (in the basement apartment). Then, after the war, (when my father returned from the world war 2) we moved to 88 Jefferson St. where we lived until 1953. The rest of my family lived there on Jefferson St. till the south mall project forced them to move. Hunter's was my Dad's business from 1929. After they interviewed him he was so affected that within 12 hours he suffered a heart attack and his heart was damaged. He never was able to go in his store again. Did Rockefeller care about my father and his family? Not one bit!